The 2003 invasion of Iraq (March 20, 2003 - May 1, 2003) was the war fought by the United States, the United Kingdom, Australia, and some other countries against Iraq, to end the rule of Saddam Hussein. The main reason that the war started was because the British and American Governments believed that Iraq had dangerous weapons of mass destruction (such as chemical or nuclear weapons) that could be used against other countries. This turned out after the invasion to not be true. Another reason for the start of the war was that many people thought that Abu Musab al-Zarqawi, one of the leaders of al-Qaeda, was hiding in Iraq after the September 11, 2001 attacks. Though Saddam Hussein was not involved in the planning of the September 11 attacks, many people accused him of giving al-Qaeda a safe place to hide from the United States. The war was extremely controversial and led to a lot of negative feeling towards British Prime Minister Tony Blair and the American President, George W. Bush. 4,734 Nato soldiers were killed in Iraq war including 4,416 U.S. servicemen, 179 UK servicemen and 139 Other NATO soldiers. 31,882 U.S. servicemen and over 3,600 UK servicemen were wounded in Iraq. 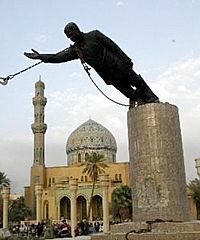 More than 100,000 Iraqi civilians who were not soldiers were also killed. 2003 invasion of Iraq Facts for Kids. Kiddle Encyclopedia.